Welcome to the Organ Failure and Transplant Network annual affiliate meeting! We are excited to bring this year’s conference to you in webinar format and give you the opportunity to view conference presentations at your convenience. This year’s conference covers the spectrum of organ failure care. Our transplant teams in heart, lung, liver, and kidney have developed educational talks highlighting both the standard of care and continuum of care for patients in any form of organ failure. As always, our goal is to partner with our Organ Failure and Transplant Network affiliates to provide the best possible care for any patient in organ failure. 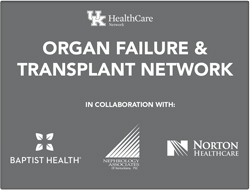 For our new affiliates, the UK Organ Failure and Transplant Network is a relationship-based initiative developed to provide definitive care for patients with advanced organ failure. We encourage physicians throughout Kentucky and surrounding states to refer patients with advanced kidney, heart, lung, liver, and pancreatic disease for care when local options have been exhausted. While organ transplantation may be one option, other treatment options such as mechanical support in the form of ventricular assist device for heart failure or ECMO therapy may also be available. Our goal is to work with referring physicians and community hospitals to provide as much local patient care as possible and to offer resources for advanced care at UK HealthCare when local care is no longer possible. We want to collaborate with physicians interested in owning the process of organ failure management from initial evaluation to transplantation. Members of the Network enjoy numerous benefits and services, including UK community faculty appointments, electronic access to patient's information, access to continuing medical education, marketing and co-branding opportunities, and participation in the UK Transplant Center’s unique mini fellowship program. We welcome you to our program and thank you for your interest in partnering with us. Enjoy the conference!